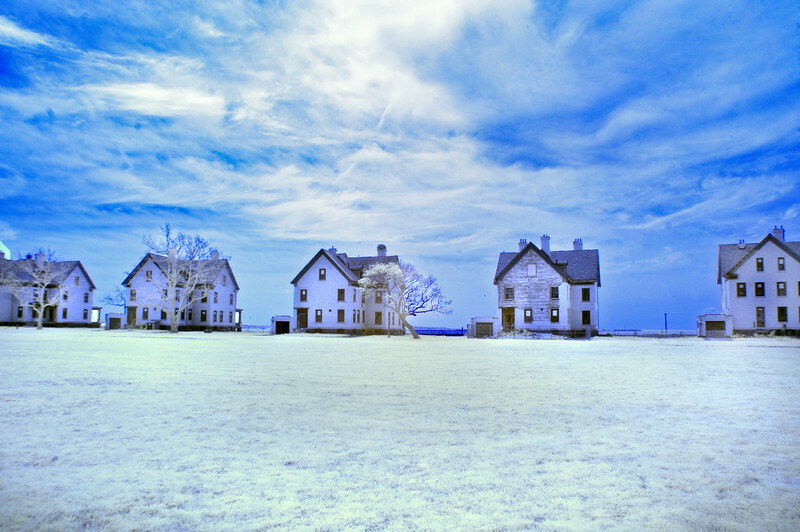 About INFRARED PHOTOS : What is an infrared photo? In infrared photography the sensor in the camera used to take the photos is altered so that it is sensitive to infrared light, which is a light that our eyes literally cannot see. IR light lies just beyond what is classified as the “visible” spectrum – that which human eyesight can detect. Accordingly, when we take photographs using an infrared-equipped camera, we are exposed to the world that can often look very different from that which we are accustomed to seeing. Colors, textures, leaves, plants, human skin, and all other manner of objects can reflect IR light in unique and interesting ways. The photos capture a distinctly different view of the physical world, whether with false color or black & white, the images generally have a dreamlike or sometimes lurid appearance. The most apparent difference is how foliage (such as tree leaves and grass) is seen. Green in the IR range strongly reflects light in the same way visible light is reflected by snow. So green essentially appears as white and all other colors are strangely different. Metal takes on a strange quality while skin, fabric and petals are almost translucent. See slide show to right comparing standard color and black & white images to infrared images.